When compiling research on the health benefits of adaptogens, the amount of data is almost overwhelming. This is due to the large number of studies and the fact that adaptogens have such a broad influence on the entire body. The reality of adaptogens is that they are effective tonics and can be taken daily for overall health. In fact, throughout the world millions of people are using these products on a daily basis. Many of the adaptogens that are commonly used today have a history of use that goes back hundreds and thousands of years. Over that time, a vast amount of experience has been gained that has gone toward understanding their therapeutic applications. This chapter will provide information about specific adaptogens that can be used for many conditions, including aging, cancer, elevated cholesterol levels, decreased immune-system function, fatigue, stress, and weight management. The disorders have been arranged alphabetically to assist readers in locating the conditions that most interest them. The adrenal glands mobilize the body’s response to every kind of stress. Adrenal fatigue is caused by adrenal insufficiency that occurs when the glands cannot adequately meet the demands of chronic stress. In adrenal fatigue the adrenal glands function, but not enough to maintain normal, healthy homeostasis. Their output of regulatory hormones has been diminished by overstimulation. This overstimulation can be caused either by a very intense single stress or by chronic or repeated stresses that have a cumulative effect. People suffering from adrenal fatigue often have to use coffee, colas, and other stimulants to get going in the morning and keep themselves going during the day. The following adaptogens provide adrenal support: American ginseng, ashwagandha, Asian ginseng, cordyceps, dang shen, eleuthero, holy basil, jiaogulan, licorice, reishi, rhaponticum, rhodiola, and schisandra. • American ginseng is an endocrine amphoteric and adaptogen useful for mild to moderate depletion of the HPA axis and adrenal glands. • Asian ginseng and licorice can be used together for adrenal exhaustion (Addison’s disease) along with conventional therapy. Adaptogens can help reduce inflammation and as a result reduce the pain associated with arthritic conditions. The anti-inflammatory action of the following adaptogens makes them useful for relief from arthritis: amla, ashwagandha, Asian ginseng, cordyceps, eleuthero, guduchi holy basil, jiaogulan, licorice, reishi, rhodiola, schisandra, and shilajit. The following adaptogens are useful for relief from rheumatoid arthritis (an autoimmune disease): amla, ashwagandha, cordyceps, guduchi, licorice, and reishi. • Amla is used to prevent and treat damage associated with connective tissue disorders such as rheumatoid arthritis and lupus. • Ashwagandha is used to treat fibromyalgia and autoimmune diseases such as rheumatoid arthritis and polymyoseitis. • Guduchi is used to modulate excessive immune response in autoimmune diseases such as rheumatoid arthritis. It can also enhance uric acid excretion and relieve arthritis with accompanying gout. • Holy basil oil is used topically for arthritis. Many people suffer from insomnia and related sleep problems. Stress can disrupt the regular circadian (time-related) secretion of cortisol and can be a major cause of sleep problems. Cortisol normally obeys the body’s inner clock and responds to light and dark, morning and night. Cortisol levels are highest in the early morning, lower in the afternoon, and lowest at night. Cortisol helps to synchronize activity, patterns of eating, and patterns of sleeping. 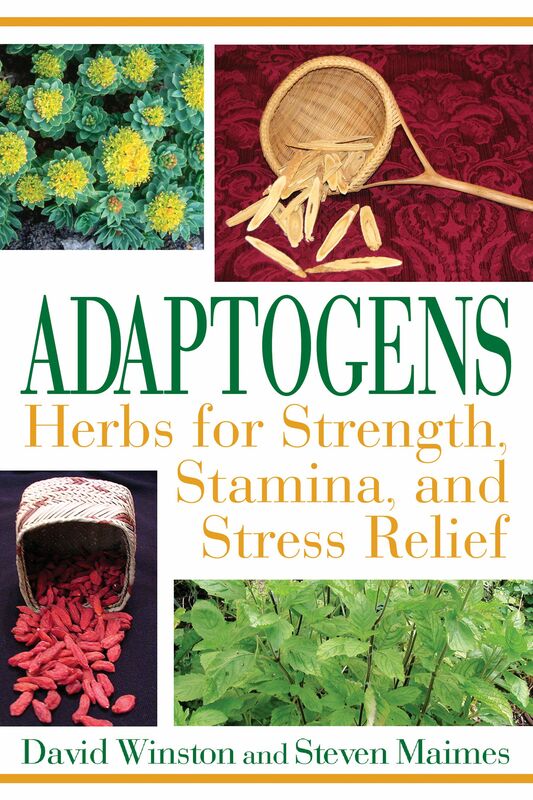 Adaptogens regulate the production of cortisol, reducing stress. A relaxed body allows for better and more rejuvenating sleep. The following adaptogens aid the body in sleeping: American ginseng, ashwagandha, eleuthero, jiaogulan, rhaponticum, rhodiola, and schisandra. The following adaptogens help relieve the symptoms of jet lag, which is caused by a disruption of the body’s circadian rhythms: American ginseng, Asian ginseng, eleuthero, jiaogulan, rhaponticum, and rhodiola. • Ashwagandha is a calming adaptogen traditionally used for insomnia and nervous conditions. • Eleuthero improves sleep quality and prevents nighttime waking. • Jiaogulan is a calming adaptogen appropriate for anxious or agitated people with unstable hypertension, stress headaches, and anxiety-induced insomnia. • Rhodiola is used to regulate sleep disorders and improve sleep quality. • Schisandra is reported to relieve insomnia and dream-disrupted sleep. Taste/Energy: Sweet, bitter, slightly cool, and moist. Location/Cultivation: American ginseng is native to the eastern United States and Canada, from the Catskill Mountains of New York and the Berkshire Mountains of Massachusetts, north into Ontario, west to Iowa, south to Arkansas and Kentucky, and east through the highlands of Alabama, Georgia, Tennessee, North Carolina, and Virginia. American ginseng requires rich soil with humus and full shade, and it prefers deciduous woodlands, especially those with tulip poplars. It takes a minimum of seven years to grow a mature root from the time of germination. Due to this plant’s endangered status, wild plants should be left alone, and you should avoid purchasing products labeled “wild American ginseng.” The best American ginseng on the market is grown organically in the woods. Properties: Adaptogen, antioxidant, bitter tonic, mild central nervous system stimulant, mild demulcent (soothes mucous membranes), hypoglycemic agent, and immune amphoteric. Constituents: The active constituents include triterpene saponins such as the ginsenosides and panaxosides. The bitter taste comes from its sesquiterpene content. Daniel Boone, in Kentucky, made his fortune trading ginseng, although he is remembered as a fur trader. It is reported in a book called Woodland Nuggets of Gold that George Washington wrote to Boone, “The war effort needs money, bring ginseng.” American ginseng helped support the revolutionary war effort, and the most valuable cargo to leave New York by ship in that time period was in the Empress of China, which was carrying American ginseng to the Orient. The plant is best known for its purported benefits to male libido and sexual performance and its ability to enhance energy and relieve fatigue. To this day, it is not uncommon for mountain people in North Carolina and Tennessee to take fresh ginseng roots and put them in a bottle or cask of corn liquor to set aside for a while. After steeping for six months or a year, the ginseng “cordial” is ready for use. It is believed that a shot of this “mountain medicine” is good for what ails you--every now and then. Modern research confirms that the American species of ginseng is an endocrine amphoteric and adaptogen that is useful for mild to moderate depletion of the HPA axis and adrenal glands. People with adrenal insufficiency often have dark circles under their eyes, are chronically fatigued, and have elevated cortisol levels. Because American ginseng affects the HPA axis, it can help correct dysfunction of the immune system, including depletion that leads to a person constantly catching colds. Amphoterics help balance deficient or excessive bodily functions, so as an immune amphoteric, American ginseng also can be of benefit for allergies and allergic asthma. It also re-regulates overly stressed nervous systems, helps deficient insomnia associated with chronic fatigue syndrome, and relieves many of the symptoms of jet lag. The pancreas is also regulated by the HPA axis, and American ginseng root also has been shown to help control metabolic syndrome (hyperinsulinemia) as well as type 2 diabetes. The reputed “male sexual tonic” effects of American ginseng also may turn out to be real. For years, many herbalists assumed that any sexual effect was due to either a placebo effect or to increased energy caused by using an adaptogenic herb. Recent studies found that the related Asian ginseng (Panax ginseng) enhanced erections and sexual performance. It is not too much of a stretch to conclude that the American species, especially with its history of use as a sexual tonic, could share this effect as well. The Eclectic physicians used this root as a simple digestive bitter. Although it has a multitude of other uses it is, in fact, a useful medicine to enhance digestion and absorption. Chewing on a small bit of the root can help stimulate the production of stomach acid and other digestive juices, making it useful for achlorhydria (lack of stomach acid), borborygmus (intestinal rumbling), and impaired absorption. Many years ago, when I was a young man, I noticed that my Cherokee uncle often would put a pinch of the dried leaf of American ginseng in almost every herbal formula he gave to people he was doctoring. One day I asked him why he did this. His response was that ginseng (the leaf or root) made everything work better. Research has shown that adaptogens do just that. Through re-regulation of the endocrine, immune, and nervous systems, they--in simple terms--“make everything work better.” Phytochemical studies have revealed that the leaves of plants in the Panax genus actually contain more of the ginsenosides (the plants’ active constituents) than do the roots. Many ancient traditions, when examined by science, are found to have more than a seed of truth. Tincture (1:5): 30 percent alcohol, 3–5 ml (60–100 drops), three times per day. Decoction: Take 1–2 tsp. dried cut/sifted root to 12 oz. water. Gently simmer for 1/2 hour, steep an additional 1/2 hour. Take 4 oz. three times per day. Capsule: Two capsules, twice per day. Herb/Drug Interactions: In a recent human trial, high doses of American ginseng altered the effects of the medication warfarin (Coumadin) in twenty healthy patients. Avoid using large amounts of this herb if taking this medication. Efficacy of COLD-fX in the Prevention of Respiratory Symptoms in Community-Dwelling Adults: A Randomized, Double-Blinded, Placebo Controlled Trial (McElhaney et al. 2006). In this study, a proprietary extract of American ginseng root reduced the risk of catching cold or acute respiratory illness by 48 percent and the duration of such conditions by 55 percent. American Ginseng Reduces Postprandial Glycemia in Nondiabetic Subjects and Subjects with Type 2 Diabetes Mellitus (Vuksan et al. 2000). American Ginseng lowered blood sugar levels in both healthy volunteers and patients with diabetes.